Libraries are so effective at providing ubiquitous and low-barrier access to our e-resources that users are often unaware they are connecting to library resources. When users say they "never use the library," our continued funding for e-resources is put at risk. 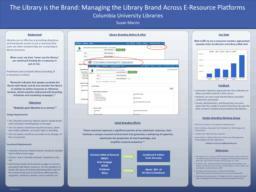 Prominent and consistent library branding of e-resources is critical.